Salco BA-35 pneumatic top carton stapler. Uses A58 and A34 staples. Salco BA-35 air-operated top carton stapler. The BA35 stapler has been completely re-designed for greater durability and ease of operation. 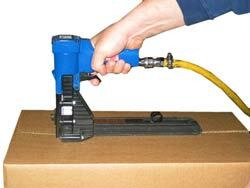 This new and improved top carton stapler also comes at a new lower price. Perfect for moderate to high volume carton closing. Uses A Type 1-3/8" crown A58 and A34 staples, leg lengths 5/8" and 3/4". BA35 is similar to CCC AC100T A. This air-operated stapler is designed for higher volume production where speed and ease of use at an economical price is a primary requirement. Intended use is for securing the top flaps of corrugated boxes after filling. For securing the bottom flaps of corrugated boxes when building from the knock-down state please see our bottom carton staplers. Light, compact, and inexpensive, the Salco BA35 top carton stapler is perfect for moderate volume usage where low cost and speedy efficiency is the primary concern.